Bren Smith, executive director of GreenWave, shares his vision for a day when there are thousands of ocean farms contributing food, fertilizers, and energy while lifting struggling coastal communities out of poverty. What is restorative, 3D ocean farming? Bren Smith: 3D ocean farming is a simple, replicable type of ocean farming which uses the entire water column to grow restorative species. It has a small footprint, because we grow vertically, and has a low aesthetic impact, too. One of the key elements that sets us apart from traditional aquaculture is that we’re protecting rather than privatizing the oceans—anyone can boat, swim, and fish on our farms. Imagine them as underwater gardens with hurricane-proof anchors on the edges, connected by floating horizontal ropes from which kelp and other seaweeds grow vertically next to scallops in lantern nets and mussels in their socks. Below are oysters in cages and clams buried in the sea floor. These farms are replicable in that they’re very simple and cheap to build since we don’t have to fight gravity underwater, which means that anyone with 20 acres and a boat can have their own farm. We’ve open sourced our model and now have requests to start our farms in every coastal US state and 20 countries. 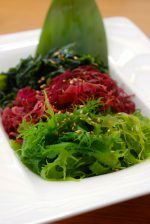 What are “sea greens” and why are they important to a healthy food system? 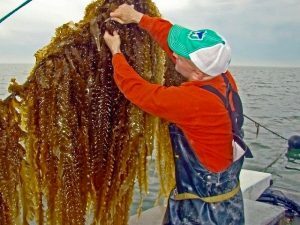 Bren Smith: There are over 10,000 edible plants in the ocean, and they traditionally have been called seaweed, but we see them more like arugulas, spinaches, and kales, so we call them sea greens. Our goal is to make kelp the new kale. Sea greens are both delicious—every farm has a different “merroir”—and nutritious. They’re rich in iron and calcium and other important nutrients. In the era of climate change, these are zero input restorative crops—no freshwater, no fertilizer, and no land is needed. We need our food system to be rebuilding ecosystems rather than depleting them and we see seaweeds and shellfish as mother nature’s technologies that can mitigate our harm by soaking up carbon and nitrogen. What is your vision for the future of ocean farming? Bren Smith: The vision is what we think of as GreenWave reefs dotting our coastlines: 25-50 farms, seafood hubs and hatcheries placed in struggling coastal communities to lift them out of poverty, and a ring of entrepreneurs and institutional buyers. Further off-shore we can embed our farms in wind farms and in conservation zones so as former fishermen, we restore rather than deplete our ocean ecosystems and serve on the front lines of building an alternative food system in the era of climate change. Why is an ocean farmer also a climate farmer? Bren Smith: The new sea-to-table is climate farming, growing resilient and restorative species for a new climate cuisine. We think of ourselves as climate farmers because the crops we grow soak up five times more carbon than land-based plants and function as storm surge barriers, protecting coastal communities, and they’re zero input. With all of these benefits combined, we’re hoping to invent an entire new ocean farming system that creates thousands if not millions of new farmers around the US and the globe. What does “food literacy” mean to you? Bren Smith: Food literacy is about understanding that food acts as a core tool for lifting communities out of poverty and building a regenerative economy. It’s about reshaping the conversation and ensuring that the food movement—and each of us—is literate in the struggles that everyday people face in making a living. Bren Smith, GreenWave Executive Director and owner of Thimble Island Ocean Farm, pioneered the development of restorative 3D ocean farming. A lifelong fisherman, Bren’s farming model is designed to restore ocean ecosystems, mitigate climate change, and create blue-green jobs for fishermen—while ensuring healthy, local food for communities. He is an Ashoka Fellow and Echoing Green Climate Fellow. In 2015 Bren was awarded the Buckminster Fuller Prize for ecological design.